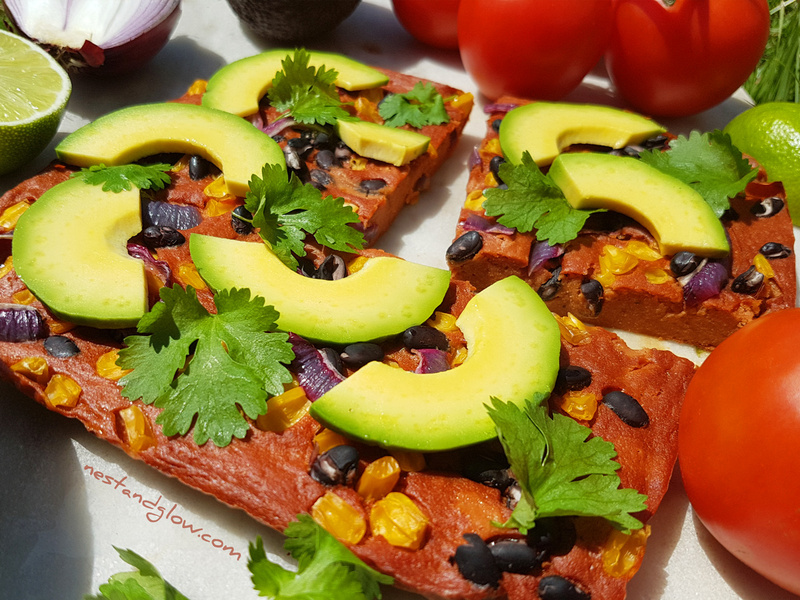 This Mexican Quinoa Flatbread couldn’t be simpler to make and is full of flavour. It has a tomato quinoa base with beans and corn baked in. Topped with creamy avocado, zesty lime juice and fragrant coriander. Suitable for vegan, gluten-free, grain-free, dairy-free, wheat-free, oil-free and general healthy diets. It may look like a lot of ingredients for a simple recipe but they don’t require much prep. It will still taste great with any of the fresh produce omitted. 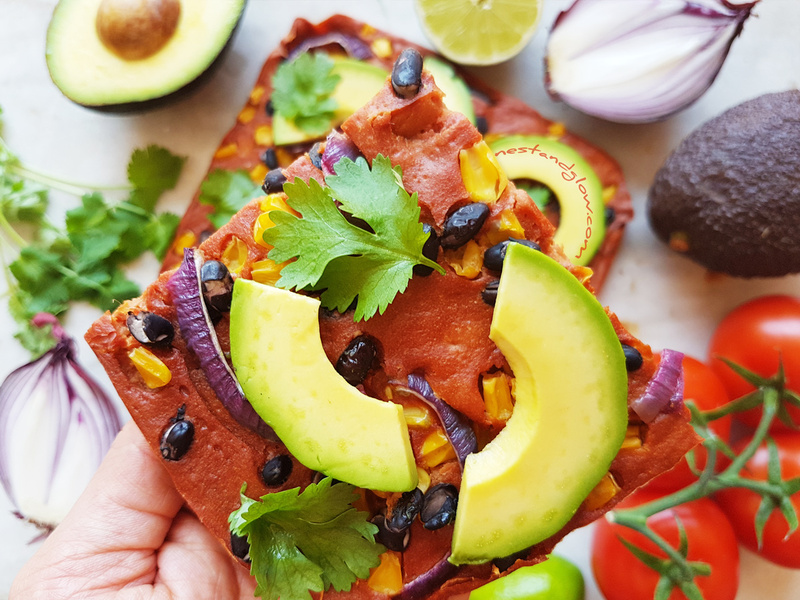 This is a complete meal as it contains a large amount of protein, heart-healthy avocado fats, several portions of fruit/veg and all the essential amino acids. Soak the quinoa for an hour then rinse and drain. Heat the oven to 450F / 230C. Add all the ingredients for the flatbread batter into a blender and blend until smooth. Pour into a paper lined dish about 8″ by 8* and then sprinkle on the corn, black beans and red onion. Bake for 20-25 mins until a cocktail stick comes out clean and the top has some colour. Remove from the oven and leave to cool and firm-up for 15 mins. Carefully peel off the paper, if it is sticking then leave to cool for longer. Top with avocado slices, coriander leaves and squeeze on lime juice. The tomato puree I use is double concentrate – they all seem to be in the UK but this might be different in other places. For the sweetcorn you can use fresh, tinned or frozen that has been thawed. I usually use frozen and thaw it in hot water for a few minutes. If you are short of time then soak the quinoa in warm water for just 15 minutes. Quinoa is one of the quickest seeds to start sprouting as it starts growing during the hours soak. It also moulds easily so I tend to only soak for an hour. If your quinoa is pre-washed (as most sold in the UK is) then rinsing is not really needed but some types are not rinsed and will taste bitter without it. In the photos and video I didn’t really add enough avocado as unfortunately it didn’t look it’s best loaded with avocado. As soon as I put down the camera to eat it I doubled the amount of avocado. Calling this Mexican-style I should have really added some cumin when I made it. This would I’m sure make an already delicious recipe even better and I will add cumin next time. As this is gluten-free it won’t be glued together as it comes out of the oven hot. When it rests it will firm up and be easy to remove from the paper all in one piece. If you try to remove it while still hot things could get messy! The turmeric is added to boost the colour and nutritional content. If you don’t like this spice then feel free to leave it out but you really don’t taste it. No need to boil the quinoa for the recipe as it is cooked when you place it in the oven. As it’s soaked and baked with a high water content you get a fluffy centre and a firm outside. If you want a crispy outside then after taking out of the grease-proof paper return to the oven to bake for another 10-15mins. I’m guessing in retrospect (after making a sloppy mess) that you do NOT add 1 cup of water as part of the ingredients for the batter. Is this for soaking? Might want to clarify this……. Will try again! Do you think you could use a silicone baking dish for this? Do you think it would release well?